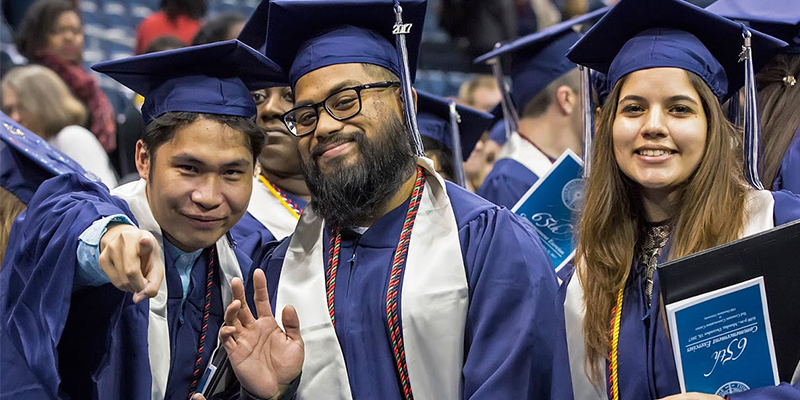 One week before Christmas, Tidewater Community College celebrated its graduates along with a military milestone at the Ted Constant Convocation Center. Wiens was the keynote speaker for TCC’s 65th Commencement Exercises when nearly 600 of the college’s 1,800 graduates walked in cap and gown in a ceremony distinguished with a military flair on Monday night. 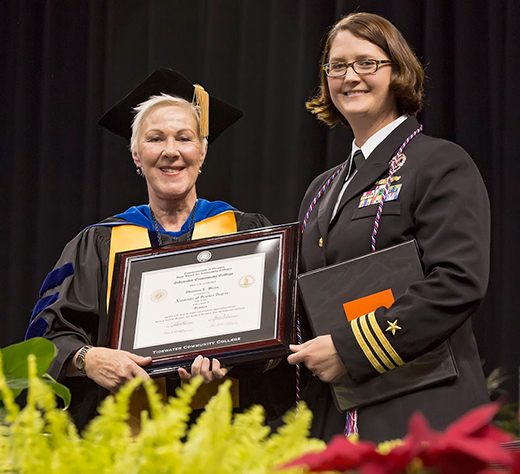 In addition to recognizing its newest alumni that earned associate degrees and certificates, TCC commemorated the 100th anniversary of Naval Station Norfolk during the 65th Commencement Exercises. Wiens, executive officer of Beachmaster Unit Two at Joint Expeditionary Base Little Creek-Fort Story, attended TCC for three years prior to completing her bachelor’s in geology at Old Dominion University. Her 17 years of service in the Navy include support of two major initiatives: Operation Enduring Freedom and Operation Iraqi Freedom. 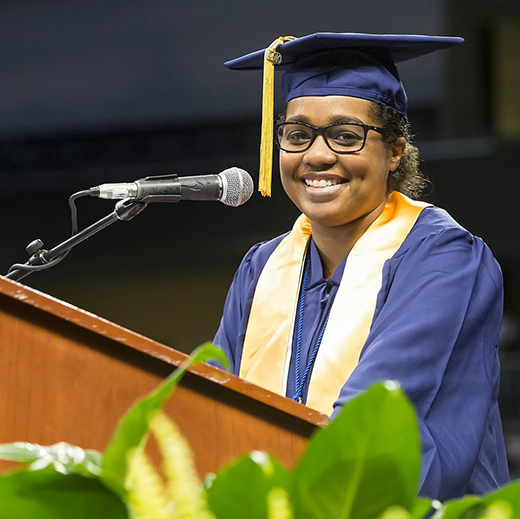 The Great Bridge High School graduate considered going away to school but ultimately decided on TCC where she connected with multiple mentors, including Professor Lynn Rainard, who would ultimately become her daughter’s godfather. President Edna Baehre-Kolovani surprised Wiens by presenting her with a framed Associate of Science in Science. Wiens was just a few credits shy of a degree when she transferred to Old Dominion, but given her bachelor’s degree and military service, she satisfies the requirements to be an official alumna. Student speaker Jessica Evans, a veteran of the Army National Guard, also fought back tears in relaying her personal journey of overcoming a traumatic brain injury suffered during a deployment to Iraq to becoming a TCC graduate with an Associate of Science in Business Administration. With her husband, Nathan, and 2-year-old son, Aaron watching, she urged her classmates to be the active ingredient in their lives and savor their accomplishments. “Be proud and celebrate that you could step out of your comfort zone, to earn that associate degree, to earn that certification,” said Evans, who will transfer to Norfolk State University to major in construction technology. “When anyone, anyone, tries to diminish your accomplishments, remember that you earned your seat here today. You are not here by accident. President Kolovani, like many in the audience, was moved by Evans’ message. “That was awesome, wasn’t it?” she asked, lauding the persistence of TCC’s graduates, many of whom shared their heartfelt stories at a weekend graduation brunch. The conferring of certificates and degrees followed. Graduates received pins from TCC’s Alumni Council and joined a network of 80,000-plus alumni and counting. Lt. Dominic Mirenda, command chaplain for Naval Special Warfare Group Ten at Joint Expeditionary Base Little Creek-Fort Story, delivered the benediction to end the evening celebration.